Anatoly Yakovlevich Solovyev (Russian: Анатолий Яковлевич Соловьёв; born January 16, 1948 in Riga – alternate spelling "Solovyov") is a retired Russian and Soviet cosmonaut and pilot. 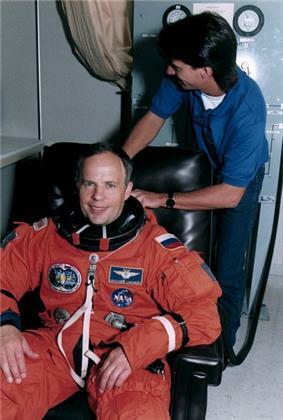 Solovyev holds the world record on the number of spacewalks performed (16), and accumulated time spent spacewalking (over 82 hours). Graduated from the Lenin Komsomol Chernigov Higher Military Aviation School in 1972. Solovyev's parents are Yakov Mikhailovich Solovyev (father), deceased in 1980 and Antonia Pavlovna Soloveva, who resides in Riga. He is married to Natalya Vasilyevna Solovyeva (née Katyshevtseva), with whom he has two sons, Gennady (born 1975), and Illya (1980). Solovyev resides in Star City. 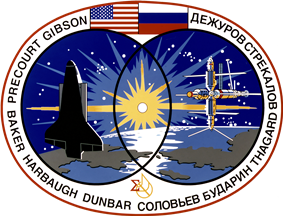 two NASA Space Flight Medals. ^ Wade, Mark (2008). "Solovyev web page". Encyclopedia Astronautica. Archived from the original on 25 December 2008. Retrieved January 12, 2009.